This two-volume set offers readers comprehensive insight into the contemporary practice of operative dentistry and the scientific principles upon which it is based. Written by a select group of experts and featuring color illustrations throughout, these volumes address all aspects of everyday procedures as well as the latest innovative technologies, making them equally relevant for the practicing clinician as for the advanced student. 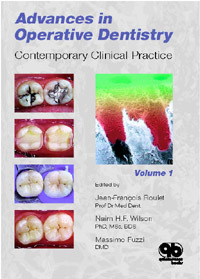 Volume 1 covers both basic and advanced operative treatment techniques, including the preservation of tooth tissues, the maintenance of tooth vitality, and the placement of direct and indirect restorations in anterior and posterior teeth. Volume 2 continues where Volume 1 leaves off, offering an authoritative overview of future approaches to operative dentistry with emphasis on the scientific basis for state-of-the-art techniques. Both volumes emphasize the importance of achieving a high-quality and esthetic clinical outcome.